Set in 1916 right before the United States entered World War I, the film follows vaudeville team Jo Hayden (Garland) and Jimmy Metcalf (Murphy). While traveling, Jo and Jimmy meet self-centered Harry Palmer (Kelly), who is looking for any way to reach the top. Jo falls for Harry and leaves Jimmy to start an act with Harry. Right before Jo and Harry are going to hit the big time, Harry is drafted into World War I. Harry takes extreme measures to stay out of the military and risks his relationship with Jo at the same time. -“For Me and My Gal” is loosely based on Kelly’s character, the vaudeville performer Harry Palmer, who did become form a team and become engaged to performer Jo Hayden. -The title was originally “The Big Time” and then “Applause” with hopes a title song would be written by Arthur Freed, according to DVD commentary by Judy Garland historian John Fricke. -The script was written with Judy Garland in mind and George Murphy originally was going to have Gene Kelly’s role. When Murphy lost the role, he said it was one of the greatest disappointments of his life, according to Fricke. -Eleanor Powell and Dan Dailey were originally slated in the cast. There were going to be two female roles (a dancer and a singer), but it was combined into Judy’s role, according to Fricke. “For Me and My Gal” is a fun film with a plot that revolves around the art form of vaudeville, which was popular in nostalgia movie musicals in the 1930s and 1940s. The introduction to the film says it is “fondly dedicated” to the vaudeville performers who traveled from town to town and lived out of trunks. Set in 1916, this musical was released in October 1942, right after the United States entered World War II. Production planning started for this film in 1940. “For Me and My Gal” has catchy songs, great costuming and a compelling story line. But for me, the film is more interesting for two major reasons: This is the first truly adult role for Judy Garland. Audiences were able to see Garland as a sophisticated young woman with an adult romantic lead and complex dance numbers. She wasn’t playing second fiddle to Rooney’s antics, which sometimes happened in her previous films, and her singing and dancing talents are further showcased. Before this film, Garland was primarily in child or teenager roles. Garland’s role in “Little Nelly Kelly” before “For Me and My Gal” also gave her the opportunity to play an adult role. However, it was a dual role- she was an adult who marries George Murphy and then Murphy’s child. It wasn’t quite the same as the woman she plays in “For Me and My Gal,” and part of the film kept her a child. The second notable fact about this film is that it’s Gene Kelly’s first film role. Fresh from Broadway playing “Pal Joey,” studio heads were uncertain how Kelly would photograph, but Garland fought for him to be in the film. 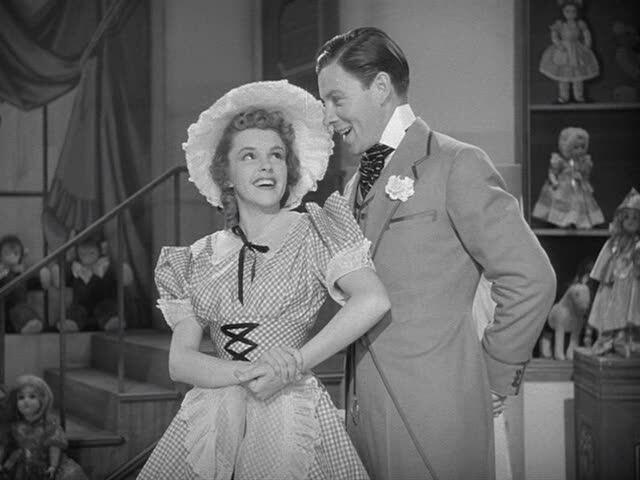 A fact new to me is that “For Me and My Gal” is loosely based on Kelly’s character, the vaudeville performer Harry Palmer, who did become form a team and become engaged to performer Jo Hayden. The film closely follows Palmer and Hayden’s relationship with some changes. In real life, Hayden had a friend named Danny Metcalf who was killed in action. In the film, Danny Metcalf was split into two people- Jo’s brother Danny who is killed and her friend Jimmy Metcalf, played by George Murphy. Hayden and Palmer married in 1919 and Palmer died in 1962. 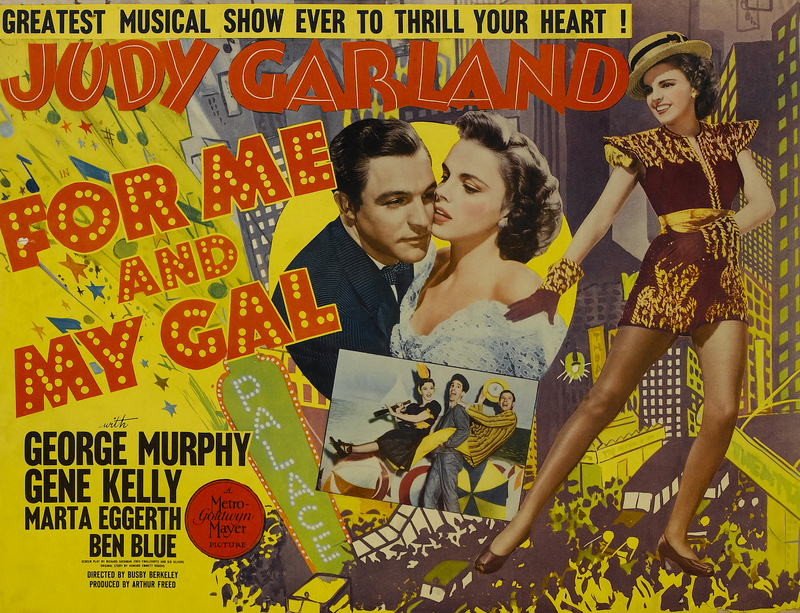 “For Me and My Gal” is an entertaining MGM musical that allows you to watch two Garland grow and Kelly start an impressive career. My only complaint is there isn’t enough George Murphy. Otherwise, it’s a ton of fun. 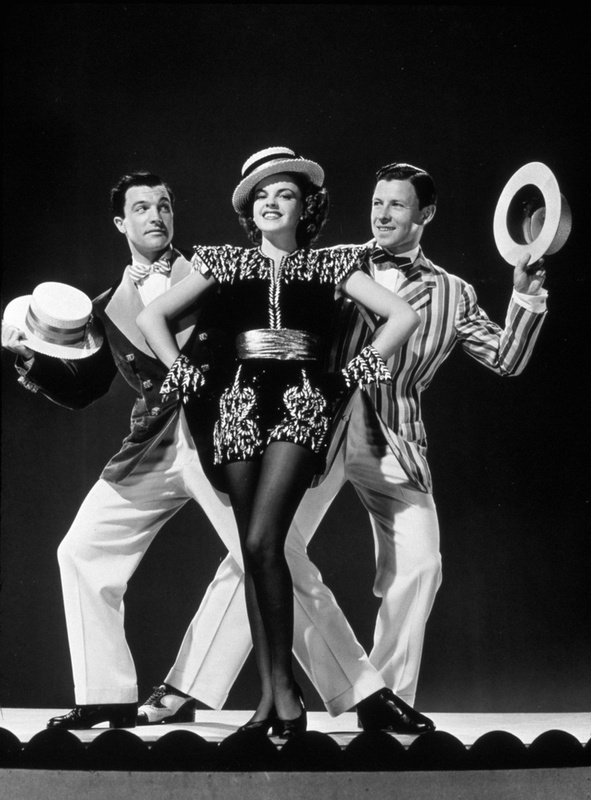 This entry was posted in Musical Monday and tagged For Me and My Gal, Gene Kelly, judy garland, MGM, Musical Monday, Vaudeville on Film by Jnpickens. Bookmark the permalink. Kelly is amazing in this. Garland is likewise. Love this film. Thanks for the alternative casting information. Great start to Gene Kelly’s Hollywood career. ADORE this movie. I’m also a HUGE fan of musicals and watch For Me And My Girl at least once a year or so. Fantastic soundtrack, compelling story, and perfect performances.